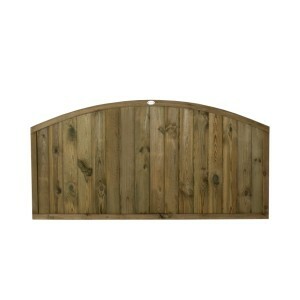 The 3ft tall Dome Top Tongue and Groove Fence Panel from Forest is a shaped panel with a quality finish that will enhance any garden. Constructed from vertical interlocking Tongue and Groove boards which are then housed in a high quality rebated frame by mortise and tenon joints. The domed shape top creates a classic fence panel with clean lines giving added aesthetic appeal to a fence run, and with a smooth-planed timber this all-round robust panel is built to last and look great. This attractive panel is ideal for use as a decorative low-level boundary marker or for partitioning. Manufactured in Poland from FSC certified timber from sustainable sources this mixed softwood panel is pressure treated which gives a natural timber colour and provides the fence panel with a 15 year anti-rot guarantee, eliminating the need for annual re-treatment. This fence panel can also be used without gravel boards.